From its formal beginnings in the early 1700’s, origami (folding paper in Japanese) has progressed from the ceremonial via the symbolic and the recreational, to its highly developed standing today. It is indeed a many-layered intellectual activity, once aptly described as “midway between art and a game”. A number of artists and authors in Japan and the West stimulated its popularity in the 1950’s. 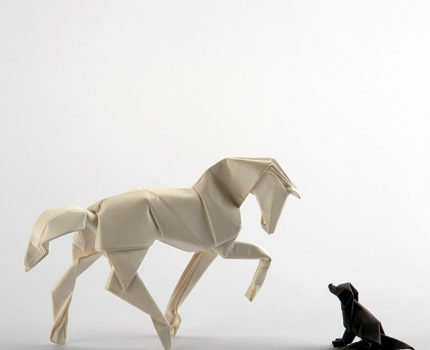 Origami can be explored by contrasting some of its many styles: engineering and minimalist, decorative and practical, technological and artistic. In this entertaining lecture, David Brill gives an insight into origami’s rich history by showing some traditional pieces from the past, comparing these with achievements of today’s origami artists and scientists. We’ll even tackle a couple of intriguing designs from this seemingly endless spectrum. He will convey some of his excitement for this art form, which requires only the very simplest raw material. David Brill was introduced to origami 60 years ago, when at the age of 5, he learned the traditional flapping bird. David joined the British Origami Society in 1974, and met many other enthusiasts who encouraged him to develop his own designs. He was BOS Chairman from 1995 to 2004. David’s book Brilliant Origami was published in 1996 and sold more than 25000 copies before going out of print 10 years later. David has worked with many styles of origami: the representational (animals, figures, scenes), the geometric (unit constructions), the practical (boxes and containers) and so on. David’s origami work is influenced by his other main artistic activity as an oil painter: in fact, each enriches the other! David has travelled worldwide to share his knowledge of origami at conventions and exhibitions.